We all knew that the Ubuntu One Music Store was coming. It had been in closed beta for quite some time now and all that we knew about it came from the few beta testers. 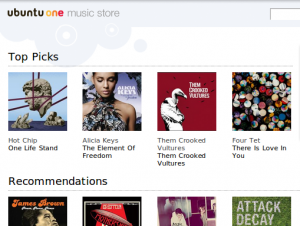 However, today Canonical has released the Ubuntu One Music Store to the public. It is still a beta mind you. The Ubuntu One Music Store will be powered by 7digital, a privately owned digital media delivery company based in the UK. Tracks offered by 7digital for the Ubuntu One Music Store will be available in MP3 format without any DRM. The store is integrated into Rythmbox. After it has been installed, you can enable it from Edit -> Plugins. Keep in mind that it is still a beta and remember to file any bug if you encounter any.